Cilantro, coriander, or Chinese parsley, is a tasty edible herb that with a plethora of health benefits, commonly added to Asian and Mexican dishes. It is actually one of the world’s most commonly used herbs. Its name, coriander, comes from the Greek, koris, meaning bed bug! The herb is green, leafy and strong-smelling with a fresh, citrus taste that makes it an extremely valuable garnish and flavor enhancer. Both the fresh leaves and stalks are edible, as well as the berries after being dried, which are also known as coriander seeds. For maximum flavor, it is best added to dishes just before serving. Its leaves improve digestion, fight inflammation, and lower blood pressure, and the seeds are dried and used for culinary or therapeutic purposes. Coriander oil, which is extracted from the seeds, has powerful antibacterial properties. Cilantro (Coriandrum sativum) is an herbaceous plant that originates from the Mediterranean region and has a long history in traditional medicine. This herb has potent anti-inflammatory, analgesic, antimicrobial, and antioxidant activities, and numerous nutrients. It is rich in vitamins C, A, E, and K, contains trace amounts of calcium, iron, phosphorus, and potassium, and is abundant in antioxidants. Coriander contains cineole, linoleic acid, and tannins, which offer various medicinal properties. Moreover, its volatile oil is high in beneficial phytonutrients such as carvone, camphor, borneol, geraniol, limonene, elemol and linalool. It is also a rich source of flavonoids, like quercetin, kaempferol, rhamnetin and apigenin, and active phenolic acid compounds, such as caffeic and chlorogenic acid. — It has powerful anti-inflammatory properties that fight chronic inflammation, the main cause of serious diseases like heart disease, arthritis, diabetes, and cancer. One study showed that it also treats rheumatoid arthritis and symptoms like joint pain and swelling. — Cilantro extracts have powerful anti-inflammatory and antibacterial properties that promote good digestive health, and relieve gas, bloating and upset stomach. Moreover, the antioxidant activity lowers the effect of Helicobacter pylori infections in the gut and prevents the development of gastric ulcers and cancer. — Cilantro leaves and oil are also beneficial as they soothe inflamed skin and treat various skin diseases. The leaf extracts have been found to treat dermatitis and alleviate itching, redness, and dry skin. Cilantro oil also prevents skin infections, and effectively fights Streptococcus and Staphylococcus strains. 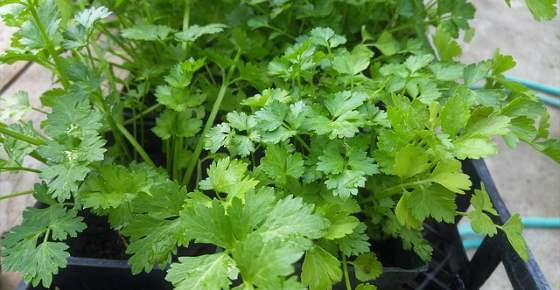 — Coriander supplements protect cognitive abilities and prevent a decline in brain function. Researchers have confirmed that inhaling coriander essential oil had positive effects on spatial memory formation, and coriander leaf extracts helped increase enzyme levels in the brain. Cilantro extracts were also found to lower the effects of stress on the brain. — Fresh cilantro leaves and extracts improve cardiovascular health since they are rich in antioxidants. Researchers have shown that they prevent blood clot formation, and blocked arteries. Coriander seed oil manages hypertension, while the seeds relax the veins and arteries and beneficially affect the vascular system. Coriander is excellent in the treatment of diarrhea since it fights numerous pathogens that can cause it. It destroys off E. coli and Salmonella infections, while its compound linalool w has a carminative effect. Cilantro eliminates heavy metals from the body, such as arsenic, lead, and mercury. Its antioxidants detoxify the liver, and the process in which it removes heavy metals is known as chelation. These properties also treat iron overdose and protect the liver from damage, and fight liver diseases. Cilantro has antimicrobial activities against yeast and fungal infections, so the essential oil destroys candida infections, and the extracts from coriander leaf treat oral candidiasis. Coriander has potent anti-diabetic effects of coriander that increase insulin secretion, and beneficially affect glucose levels. Studies have found that the cilantro seed powder significantly lowers blood glucose levels, and compounds such as phenolics, flavonoids, and tannins manage diabetes symptoms. Cilantro extracts can also help treat anxiety and depression. Coriander extracts have been found to be as effective as diazepam in relieving feelings of anxiety. Cilantro can benefit mental health by improving sleep quality. While most people tolerate cilantro well when used as an herb and spice in cooking, there are some reports of allergic reactions to taking cilantro in medicinal amounts, and its topical use can lead to symptoms like itching, and redness. Additionally, avoid it 2 weeks before and after any planned surgery. It also increases the risk of bleeding in people with bleeding disorders. You can add cilantro in salads, soups, curries, chutneys, and sauces, or take it in the form of capsules, tinctures, or herbal teas. You can also make coriander tea at home. This ancient Ayurvedic treatment has been used to help cure many diseases. Add the coriander seeds in a cup, and pour the boiling water over them. Leave to steep for about 5 minutes, and strain the mixture. Drink a cup of this beneficial drink 2-3 times daily. Enjoy!